Home World Middle East Syria – The Last Stand Of The Righteous! Syria – The Last Stand Of The Righteous! Over the past several years, the Assad regime has been destroying the ancient city of Aleppo where commerce began in Syria. In Aleppo, which is one of six world heritage sites in Syria, the City was once a vibrant business center – not just for the past 50 or 100 years, but dating back over 1000 years. Many districts of the ancient city have remained essentially unchanged since its construction during the 12th to the 16th century. Shocking Scenes From Aleppo As Never Seen Before – A world heritage site in ruins! As with all other areas of Syria, this systematic destruction of Aleppo’s buildings and infrastructure has had one evil purpose. The “Human Monster” (aka Bashar al-Assad) has spent the last four years on a non-stop mission to annihilate the Syrian Opposition that he vehemently calls “the terrorism.” How does Assad define “the terrorism?” The only way to know this for sure is to measure him through his actions. If Assad was chasing after terrorists as defined by the world community (i.e. al-Qaeda) then the deaths on his hands would not be questioned. This isn’t the case! Assad has sent all of his resources throughout Syria by ground and by air to kill any Syrian people who are in his way. His Syrian Arab Army (SSA) has fought the Free Syrian Army (FSA), the Islamic Front (IF), and various other groups on the battlefield. The Air Force has dropped missiles and the newly used vacuum bombs in Douma. Helicopters have dropped barrel bombs filled with TNT, nails and bolts, chemicals, chlorine gas and any other invasive item to be thought of. In addition to the regime’s regular military, Assad also has Special Forces teams, Special Intelligence teams, and loyalists (local community members he can call on to do his bidding). When he needs people to carry out horrific criminal acts of mass murder of the cruelest kind, Assad calls upon a group of paid criminals that are called Shabiha (in the US these people might be called “low-life mafia”). In a recent BBC interview, Assad denied having Barrel Bombs. He denied dropping barrel bombs, or any kind of bombs on civilians. When ask if he was aware that there were 250,000+ people who had been killed [including 25,000+ children] as a result of his military actions, he refrained from answering. The interviewer then asked Assad if he thought the deaths of these 250,000 people, as least the women and children, were collateral damage and he appeared to affirm this answer. 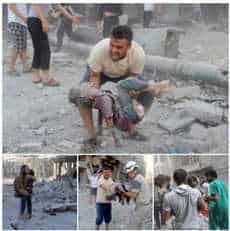 The Assad regime has intentionally dropped barrel bombs on neighborhoods, Muslim mosques where people were praying, Christian churches have been damaged due to secondary projectiles rather than a direct hit from a barrel bomb, playgrounds full of children playing, schools where children were in class, and bustling markets or souques. 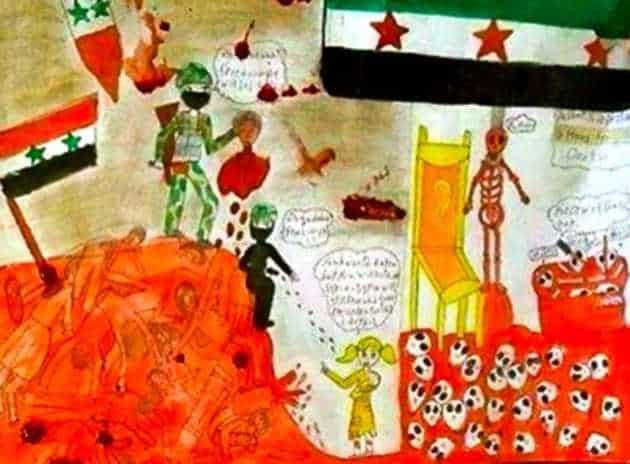 One child from an Aleppo school drew a picture of how she apparently interpreted were her feelings of the Syrian War and how it affected the people. This painting holds the visions of a child well beyond her years. This child’s picture was found hanging on the wall of an elementary school in Aleppo after it was hit by a barrel bomb where many of the children were killed. The vivid painting depicts the terrible experiences and horrible pain the children of Syria have been exposed to at all ages. The thought of recovering from this kind of emotional torture will take years of love and a wrap-around program of community mental health. Millions of Syrian children have faced this same experience repetitively, some worse than what this picture can even define. When the Syrian Arab Army leadership began defecting as early as 2012, it was those officers who helped to start the FSA. The Syrian conscripts were in disarray due to lack of leadership. Over time, many officers and conscripts continued to defect to “the other side” to join the FSA. Those that didn’t make it to the protection of the FSA, were executed by the Assad regime immediately or thrown into the feared Security Prisons. In need of a solution for the Army “Out of Control,” Assad reached out to his friends in Iran for help. Iran stepped up and took a leadership role in Assad’s army, including bringing their own recruits from Iran, Iraq and Afghanistan. Iran and Assad also have a relationship with Hezbollah in Lebanon which has guaranteed support troops from Syria’s Southern border as well. Iran and Assad have very effectively over the years built a terrorist network in the Levant which has now clearly paid off to rescue “Assad’s throne,” when he was at risk of losing it in May of 2013. They even brought in a wild card to ensure the revolution was derailed by calling up their old friends from ISIL. The terrorist organization was invited to Syria to collude with the Assad regime with the end result being to derail the Syrian Revolution and save Assad’s throne. Under the support of Iran, ISIL moved into Syria, quickly changing their name to ISIS and began working with Assad to create “havoc and hell” in Syria. As long as ISIS was rewarded well for their activities, and they could further their own private mission, they were in “Terrorist Heaven.” Assad provided them with the beginnings of a Caliphate dream, and access to unlimited revenue through oil & gas sales. ISIS was able to “capture” oil & gas fields then turn around and sell the oil & gas right back to Assad for a fair price. Instant revenue! One of the most effective results of the ISIS strategy that Iran and Assad accomplished is it totally pulled the International Community’s eyes off of what they were doing. In fact, in a twisted perversion, it actually made some people in the West begin to think that Iran and Assad could become partners, when all along they have been and still are working against the West in both Syria and Iraq. I have heard it called an illusion, some say the West is “under a delusion not Assad;” or is this is a well-planned deception by Iran and Assad? What Is Happening In Aleppo Now? Aleppo has been the center of a long and hard battle, with many actors. The City of Aleppo and the surrounding area is a battleground that the Assad Regime does not want to lose, as it stands for a lot of things in Syria but most of all it is the ancient city of commerce. Next to Damascus, according to international recognition, it is the second most known city in Syria. If you are not big on religion or history, you might be familiar with Aleppo Soap, known for its great properties, which is made right in the town of Aleppo … not made in Taiwan with a license to use the Aleppo name. There always have been and still are many actors in the fight in Aleppo, including the Assad regime, Kurds, Jabhat al-Nusra, Free Syrian Army, Islamic Front and ISIS have been in and out. Over the past couple of years, there have been some terrible events in Aleppo, with citizens always in the middle. Jan 29 2013 The bodies of at least 65 young men, each executed with a single gunshot to the head or neck, were found on Tuesday in a river in Aleppo city, adding to the grim list of massacres committed during Syria’s 22-month conflict. The Syrian regime blamed “the terrorists” however many people came forward to claim that their family members were kidnapped by the Regime. Jan 7, 2014 ISIS executed 50 Syrian Activists and left them in the former Aleppo Eye Hospital where they were being held prisoner. ISIS apparently executed the Activists as they were abandoning this position. Feb 6, 2014 Al-Nusra successfully detonated what was said to be 20 tons of explosives loaded in a truck. It breached the Prison’s main door. According to Aleppo Media Center, over the past 3 days there have been many hit and run fights between rebels and regime forces in an effort to gain control of the prison. Despite losing about 50 men from their ranks, the regime was able to prevail, by using air power. The greatest benefit of this prison breach was the confirmation that Assad had women and children in the prison which he previously refuted many times. This photo (right) was taken and released by Assad Regime Shabiha (regime paid thugs, loyalists). The tides may have changed in the last two weeks in Aleppo. The Free Syrian Army and allies have had meaningful success against the Syrian regime. The Free Syrian Army in its many independent brigades has coalesced in Aleppo to fight against Assad who is called “the Lion” or “the System.” Whether the change is due to the shocking action that Assad recently took against “Douma with Vacuum Bombs and Barrel Bombs” since the beginning of February, or if they have seen enough destruction in Aleppo, or maybe both; the Free Syrian Army has demonstrated a fierce attitude. According to Agency Shahba Press, the FSA has been winning hard battles in Aleppo over the past few weeks. During the period from February 5th – 18th, the Free Syrian Army battled “the Regime and their mercenaries” on many fronts and killed hundreds of opponents. It has been reported that in this first two week period, the FSA “rooted out of the country-side or destroyed” more than 350 enemy fighters. In the town of Ratyan, in the countryside of Aleppo, the Assad regime and its allies carried out a horrific massacre. The Syrian regime forces and their associated mercenaries killed 48 Free Syrian Army fighters and their family members during the massacre that took place on February 18th. The families were almost exclusively shot in their homes, shortly after the town fell to the regime offensive which included mercenaries from Iran, Hezbollah, Iraq and Afghanistan. There were approximately 100 regime soldiers that were killed in the battle. As prisoners were rounded up and taken to a holding center, Agency Shahba Press sponsored a live interview of all of the prisoners. It is interesting to listen to the prisoners first state who they are and where they are from, as it certainly supports the general opinion that the Syrian Army has backfilled their military with foreign fighters. The other fascinating information that comes to light in the video is the foreign fighters deny taking part in the killing of the FSA families and turned on their SAA “partners in crime” making them the scapegoats. On February 21st, Agency Shahba Press reported “the Free Syrian Army rescued 250 detainees from the Syrian Regime who were being held in a school in the town of Hardtnin.” Over a two day period, hundreds of FSA and Regime fighters were left dead. The civilian detainees were delivered to a field hospital where they had been imprisoned. The physician at the field hospital in charge of receiving the injured and certifying the dead, told a shocking story about the condition of the people that were held as detainees. The physician, Abu Nour, spoke about the massacre that he described as a “criminal act carried out by Assad’s forces against civilians, children, women and elders.” He said there were three injuries of women resulting from gunshots over the three days of fighting to rescue Hardtnin from the Regime’s hold. The physician stated that the 250 detainees were children, and women, and one man. He was horrified at their condition as many had not been fed in several days, and worst there were 10 pregnant women who had not had any pre-natal care. There were children with asthma, and many people with diabetes, high blood pressure and other serious medical conditions that were not under any medical treatment. The Dr., Abu Nour, reported that four of the children with Asthma were in deplorable condition. Once again, this case of detainees is proof that the Assad regime has lied to the International Community over and over about who they are detaining. The regime made a statement during Geneva II in January 2014, and has said it many times since that they do not have any women or children in their prisons. In an interview on Thursday, the Syrian government told Al-Arabiya that “the success of a U.N. bid to freeze fighting in Aleppo hinged on whether foreign states that back the ‘insurgents’ can get them to comply,” and that no time frame had been set for the proposed ceasefire. It is interesting that the Syrian government has changed their language defining the “opposition” from terrorists to insurgents. a person who rises in forcible opposition to lawful authority, especially a person who engages in armed resistance to a government or to the execution of its laws; rebel. a member of a section of a political party that revolts against the methods or policies of the party. The relationship between Jabhat al-Nusra (an al-Qaeda affiliate) and Syrian Revolutionary Fighters is complex. Although JAN often fights parallel to the Free Syrian Army and the Islamic Front, their relationship is tenuous. In Aleppo, Jabhat al-Nusra is considered an ally of the Free Syrian Army when fighting Assad and ISIS. Although there have been times when the actions of JAN in Aleppo were directed at the Regime such as cutting off water, they also hurt the citizens of Aleppo, which was unforgivable. This action was noted in a UN Security Council Meeting as a criminal action. In the past two months, Jabhat al-Nusra has been executing their “narcissistic dream” of establishing a caliphate in the Idlib Providence of Syria, through brute force overtaking the U.S. supported Free Syrian Army who held the area for two years prior, arresting the FSA members and stealing their weapons. However, this is really the least of their violations. JAN has been on a ruthless mission to gain control of the people who refuse to be reigned by these criminals. In Idlib, Jabhat al-Nusra has been acting more like ISIS. The people of Idlib are protesting and asking that Jabhat al-Nusra leave them alone and leave Syria. JAN has begun a level of violence that has definitely been notched up. They are not distinguishing between men, women and children. Their targets are regular citizens, rather than Assad, Hezbollah or even ISIS which had previously been their favorite foes. They have also arrested Free Syrian Army members in Idlib, killed a commander, and recently caused the death of another FSA member under torture. The number of violations against Jabhat al-Nusra against civilians mounts every day and the crimes become more egregious. They have executed two women recently in Idlib for adultery in the open street with no apparent required evidence or witness. There have been homes burned, and Qurans. Young women have been harassed for wearing the hijab rather than covering in a niqab. This is a sad turn of events, as most of the members of JAN are Syrians who mostly have the same goals as other Syrians … to be free of the Assad regime. Post by ‎إنتهاكات جبهة النصرة Jabhat Nusra Violations‎. Middle East Eye reported in their video that Jabhat al-Nusra has a multi-national force that is extremely well trained. JAN has always been thought of as made up of mostly “home-grown talent” … primarily Syrian men who went to al-Qaeda not for the philosophy but for the arms and paycheck. Additionally, the general thought from the people that I interviewed said that JAN did not violate citizens. Clearly, their make-up and their tactics have changed. Something must give with JAN, as the people of Idlib will not continue to be oppressed by this group of terrorists. Did Former US Ambassador Robert Ford Speak To Soon About US Support of FSA? Syrians will not tolerate an Islamic State, whether that State is dreamed up by ISIS or Jabhat al-Nusra. Both of these groups will fail if Syrians who are not Terrorists are given an opportunity to succeed. Syrians do not want to live in a TERRORIST STATE. The historical decision of whether the International community would or WOULD NOT help the Syrian Opposition has been perverted into a decision point based on “who is worth being armed based on how religious they appear.” This has caused two or more years of delays while countries such as the US have sought out the “moderate” FSA vs presumably the Islamists. “Vetting” processes have been developed and redeveloped. The International Community’s concentration should have been placed on “training and equipping” Syrians who were committed to protecting the people of Syria and the future of Syria as a free country. Sat back while over 3 million Syrian Refugees have fled to Syria’s immediate neighbor’s Turkey, Lebanon, Jordan and Iraq. Miscalculated the growth and military ability of ISIS which has allowed them to terrorize innocent people in both Syria and Iraq, by diverting the International communities’ activities of Iran and Assad. Misunderstood Iran’s influence on the area from Iran to Lebanon, and how they have cleverly worked with Assad to implement a terror network that supports their goals. Miscalculated how deeply Iran has infiltrated the Iraqi government and the Iraqi Militia, and the Lebanese Hezbollah. Additionally they have recruited foreign fighters from Afghanistan and Yemen to come to Syria and fight for Assad against the Syrian Opposition. The way to prevent Syria from turning into a terrorist state is to support the Syrian Revolutionary Army that are working for a Free Syria, rather than measuring those groups based on their religion or how religious they are. If it hasn’t been made clear, Scholars and Clerics from throughout the world are sending a message that there is no connection between Terrorism and Islam. In the case of ISIS and Jabhat al-Nusra, these terrorists have hijacked Islam to further their terrorist agenda. 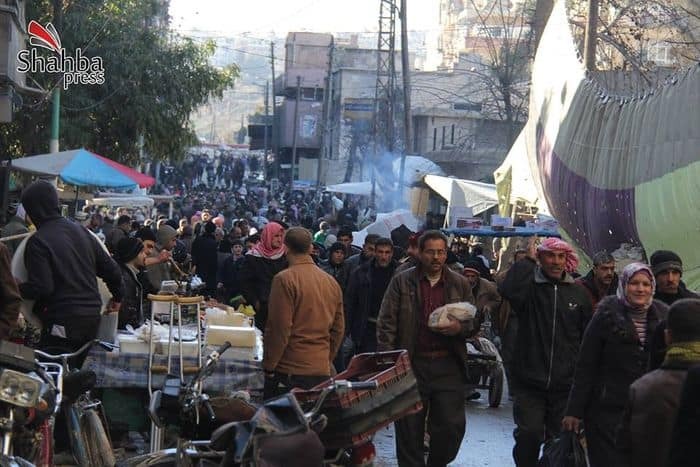 In the areas of Syria that have been declared “Free” zones, local economic development (LED) projects should be started that will begin to revive those communities, but also help to support the other areas of Syria that are still struggling under the rule of the Assad regime. Through creative thought and careful planning (LED) could present a light at the end of a dark tunnel for Syrian families who have sat on the sidelines inside Syria with no means of support and no “Plan B” as humanitarian aid has been dicey at best. It is time to do better now! Time is running out. Kimberly Jones is a global nomad with a special interest in the Middle East and North Africa. She grew up in Saudi Arabia and traveled throughout the MENA growing deeply attached to the people and the culture.